A solid oak free standing scoring cabinet by George Wright of London circa 1890. A Country House cabinet to score billiards, snooker and Life pool, central slate panel flanked by revolving number bars and lettered Life pool panels with inlaid ebony and boxwood sections. 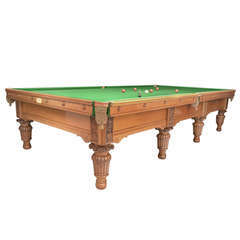 Complete with a central glazed ball storage compartments with the facility to hold a selection of snooker and billiard balls, complete with a "Penny slot or stake holder section". All mounted on an attractive base with various cupboards and drawers. Purchased from Hexton Park Hertfordshire. Victorian oak snooker cue stand, with a shaped top, original cast iron cue holders and removable tray, standing on original cast iron paw feet.